My "not so" Simple Life: Finding The Perfect Father's Day Card! Finding The Perfect Father's Day Card! Still looking for that perfect card for Dad this Fathers day? 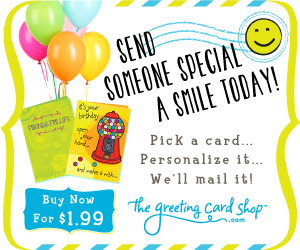 What about a personalized greeting card? The Greeting Card Shop has some beautifully done cards available at a great price. Their website is very easy to use: Browse their large selection of cards --> Pick the one that is right for you --> You can then use their greeting card message or customize it to say whatever you want! --> Address it to the person you are sending it too and they will mail it for you!! Right now with this exclusive offer: Buy 2 personalized greeting cards and get your 3rd card free. Simply enter Promotion Code: 3RDFREE at checkout and $1.99 will be taken off the checkout total! Visit The Greeting Card Shop today, offer expires 7/31/2013.